Sol Bamba celebrates with team-mates after scoring a late winner on Saturday. 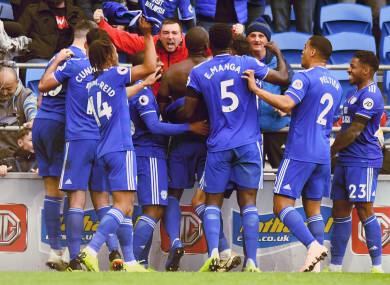 Paterson hit the crossbar with his follow-up before Ivory Coast defender Bamba slammed home the rebound to seal Cardiff’s first win in three games. Email “Dramatic scenes in Cardiff as Bamba snatches 90th-minute winner to punish 10-man Brighton”. Feedback on “Dramatic scenes in Cardiff as Bamba snatches 90th-minute winner to punish 10-man Brighton”.